How can you go wrong with this pedigree and these horns? 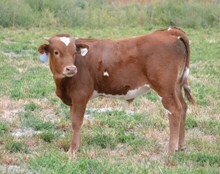 This is a lovely cow we got at the 2012 Legacy Sale from John and Darlene Nelson. She is so pretty and sweet!